For Windows XP ISO Images, use CDimage. It has the boot image required for booting. 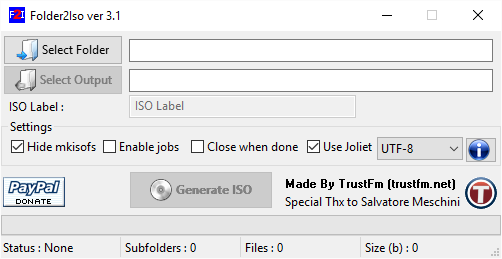 You can also download just the BootImage to use with other software, but Folder2Iso does not provide this option. 2. Specify the root dir of your CD (the ISO Folder). 3. Specify the path and filename (where to save the ISO). 4. Click "Creation" on left > Click "Start Image Creation". Ah, yes...autorun. Your answer reminds me of how much I still need to learn. Thanks. I compiled Mini XP to run on a HDD. It depends on what kind of ISO. Usually, the ISO should be bootable by itself without any further modifications if it was meant to be bootable. But you can add a text file labeled "Autorun.ini", which will make it automatically boot up and load a specific file. You can search on Google to learn more about "Autorun.ini". But what kind of ISO are you trying to create? @Magibon...I had my boot image & cat clearly marked in a folder in the compilation, but the outcome wasn't bootable. How did you let the program know you wanted a bootable .iso? usually, i make a portable version of UltraISO for creating ISOs. But after this recent clean install of Windows 7 and spending 2 days testing out Custom Themes, i all "Softwared" out. and decided to try this instead. 127.0.0.1 what does this mean? I tried an earlier version of this and I liked it. I like the addition of the abort command. It's nice for quick run ISOs. ImgBurn... all ya need. Its about the same size of this app and does a whole lot more. I haven't used this yet, but it's a great concept. I hope it works alright.